Some tips on how to cure squeaky brakes. Before you start, look at the old pads. Were all 4 worn about evenly? If not, repair/replace/rebuild your calipers. A sticking piston does nothing for stopping power, even if you have the best sintered metallic racing lining material and cross-drilled/grooved rotors on the market. All 4 pads HAVE to press against the rotors with pretty much equal pressure. Make sure the REAR brakes are in good order - no grease or brake fluid leaking, and wheel cylinders functioning, good linings and adjusted properly. Inspect fluid (should be clear - if cloudy gray/black - change it). Inspect brake lines - both metal and flexible. If you can't remember when you changed the flex lines, it's time to replace them. (Most important to eliminate squeal) Use the softest STOCK pad you can find -not ones made for racing, not ones guaranteed for 5 million miles. Soft ones will stop you just fine in street driving if all components are functioning as they should. 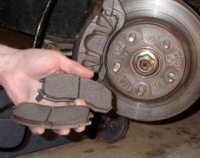 These pads will wear out in about 6-10,000 miles, depending mostly on your traffic conditions and driving habits. Replace them before the lining is gone and your rotors will last a long, long time. The harder the pad, the shorter the rotor life. Order the standard OEM product for your car and you can't go far wrong. Stay away from the racing pads unless you're building a race car to not be driven on the street. Bevel the leading and trailing edges of the lining on those pads to about 45° with a grinder/sander/rasp, whatever you have. Use the silicone goo on the backs as directed. Install the 4 bolts holding the rotors to the hub in criss-cross fashion, tightening evenly in 3-4 steps to proper torque. As an extra measure, I had some very thin copper sheeting that I cut into the same size/shape as the pad backing plate. I used those against the caliper piston so there is the copper, then the silicone, then the backing plate of the pad. My brakes are totally silent. I replace the pads about every 6000 miles or so. Never intentionally "ride" the bakes to overheat them. Heat is your enemy - it will glaze linings, it will warp rotors and even drums. You can dab the brakes to dry things off if you go through a deep puddle, but just a little is enough. Comments on "Quieting Brake Squeal"
GRINDING THE EDGES OF THE PADS WORKS. I BOUGHT PADS BUT DIDN'T NEED THEM. ALSO IT TOOK AWHILE TO FIND OUT I DID NOT NEED TO TAKE CALIPER OFF.